Our alpacas are part of a generational breeding program spanning 20-plus years. We have introduced specially selected bloodlines to diversify and enhance our core herd. Knoblock's Prairie Ranch chooses alpacas for the best in genetics, conformation, fiber, and color lineage. We specialize in producing alpacas in grays and blacks as well as shades of brown and fawn. 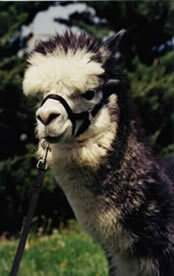 More than 120 Peruvian, Bolivian, and Chilean bloodlines produce our all-American huacaya and suri alpacas. Offspring and lineage of outstanding herdsires such as 5Peruvian Royal Inca Legend, 6Peruvian Garcia and Signet's Silver Esclade of KPR is available for purchase. We offer package discounts and fair prices. Agistment is also available. Contact us for more sales and breeding information.